New Orleans Virtually in the blink of an eye, despite huge divisions on the street and throughout the state, somehow, unbelievably, Michigan is now, like the solid south and some of the West, the 24th state with a so-called “right-to-work” law. The law, signed yesterday, takes effect in the spring of 2013. In fact for many workers under collective bargaining contracts I suspect, without knowing for certain, that the full impact will not take hold until existing agreements expire and new contracts bar inclusion in the language. In Louisiana despite passage of the law in 1976 some contracts allowed union-shop provisions into 1978 and 1979, until renegotiated. In Michigan with some long term contracts in auto and heavy industry for up to 5 years, the full impact of this devastating political attack on labor may not be realized for several years. I could also be wrong since I haven’t seen any discussion of how the new legislation affects existing collective bargaining agreements. I also may have been wrong in applauding labor’s efforts to push back at the Wisconsin-style efforts in that state and by their governor during the last election. I had argued early this fall that this was a good strategy for labor under fierce attack to establish that it still had majority support. Unfortunately in big fights where the fruits of victory may be larger, so also are the risks of defeat. Many now believe that labor overreached in trying to establish some additional protections in the Michigan constitution for collective bargaining, and labor was defeated soundly. I had dismissed this as the difficulty of winning constitutional changes as opposed to standard electoral initiatives. Unfortunately the loss at the ballot box on restoring bargaining rights for low wage home health care workers was also emphatic. The old advice that when you “slap the bear,” you better bring the bear down seems to prevail here. The business and right elite within the significant Republican base in Michigan saw this as weakness and made the political decision to call in their chits and deliver a blow to the longstanding political clout of labor by ripping the wallet right out of our workpants and making dues collection infinitely harder. Unfortunately too many people without union experience don’t get our case. The right’s argument that letting membership dues be an individual decision seems reasonable to too many of the public and even some number of workers who are more ambivalent in understanding the push-and-shove of collective bargaining between unions and management. This is the same problem faced by our support of card check recognition systems as opposed to union elections. Despite the fact that unions are philosophically committed and legally tied to internal democracy, the seemingly undemocratic procedures around our positions about dues and elections are confusing. Many are swearing that the elections in Michigan in 2014 will overturn this. 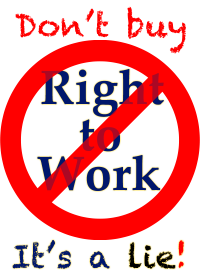 Having watched and listened to the late Victor Bussie, longtime president of the Louisiana AFL-CIO commit many times during his career after 1976 that he would not retire and not rest until right-to-work was repealed in Louisiana, I can tell you it is best not to wait, but to go to work immediately. The longer r-t-w, the harder it is to get rid to the damned thing. A generation of workers in Louisiana has now lived under right-to-work and no one sees a different future now. Michigan has proven that this can happen anywhere now in these polarized times of political class war. No one is safe. Everyone had best be ready. This seems a fight to the death for traditional worker organizations.